Dazzling dance, electrical music and youthful spirit has burst onto the Palace Theatre stage in Manchester this March, with an all-star, all-new production of the iconic musical Footloose, which is touring the UK. Based on the 1984 screen sensation, Footloose: The Musical tells the story of city boy Ren, who has to move to a rural backwater in America where dancing is banned. All hell breaks out as Ren breaks loose and soon has the whole town up on its feet. Featuring classic 80s hits including Holding Out for a Hero, Almost Paradise, Let’s Hear it for the Boy and the unforgettable title track, this major new UK tour stars Gareth Gates as Willard and Maureen Nolan as Vi Moore, with Luke Baker playing the title role of Ren – the role made famous on screen by Kevin Bacon. Footloose: The Musical is at the Palace Theatre from Monday 14 to Saturday 19 March, as part of its UK wide tour. Luke Baker will play Ren McCormack, the role immortalised on screen by Kevin Bacon. Luke recently finished playing Theo in Green Day’s American Idiot in the West End, with other West End credits including the Olivier Award-winning Sunny Afternoon, Beautiful Thing and I Can’t Sing. The cast also features Hannah Price as Ariel Moore, Nigel Lister as Reverend Shaw Moore, Nicky Swift as Ethel McCormack, Joanna Sawyer as Rusty, Matthew Tomlinson as Chuck, Natasha Brown as Wendy-Jo, Miracle Chance as Urleen, Thomas Cotran as Jeter and Scott Haining as Bickie. The cast also includes Lauren Storer, Natalie Morton-Graham, Luke Thornton and Alex Marshall. I was a big fan of the movie years ago and love the key songs from the soundtrack, because of this, and the hype about the two well-known cast members I had really high hopes for this musical. It was quite slow to start and somehow lacked energy for a fair proportion of the show, which was a tad frustrating given the up-beat music. The ‘Holding Out For A Hero’ number really livened things up, and was my favourite number of the show, followed by the ‘Footloose’ number for the finale. Hannah Price was truly sensational as Ariel Moore. You would never have known Footloose is her professional debut, she is surely destined for great things! She was endearing, charismatic and had flawless moves and vocals. Gareth Gates was utterly hilarious and charming in equal measure as Willard. He was impressive in a comedic role and I think in all honesty it was both him and Hannah Price who carried the show. It was a shame that the show did not afford him the opportunity to showcase his incredible vocals, as it was was obvious from the small parts of singing he had that his vocal talent far exceeded that of other cast members. His performance lifted the audience and he received a fantastic response during his key parts. His American accent was impressive and consistent throughout. The trio of Natasha Brown, Miracle Chance and Joanna Sawyer were strong and worked well together as Wendy-Jo, Urleen and Rusty. They were in-sync, funny and very entertaining and in particular Joanna Sawyer had some outstanding vocal moments. It was rather deceiving I felt to use Gareth Gates and Maureen Nolan to sell the show as neither plays a lead role. Although Maureen does have a couple of musical numbers, Gareth never gets a chance to show off his singing talents and Maureen’s character was such that she only really gets the chance to let loose in the final number. The major strength of this production I feel is the musical talent of The Company. They accompanied themselves on a range of musical instruments during the show which was very impressive. Many playing multiple instruments, for example, Gareth Gates plays guitar and keys, Hannah Price plays keys, trumpet and clarinet, Natalie Morton-Graham plays the role of Eleanor as well as sax, clarinet, keys and trumpet. This was a really fascinating aspect of the show and must be quite rare. Ren McCormack is usually played by Luke Baker but when we saw the show it was his stand in Thomas Cotran. It must be a hard job to stand in for a lead role but I do think that Thomas struggled with the vocals. His acting was quite convincing but something was missing about the performance. I think I expected to be overwhelmed and I was left rather underwhelmed by Footloose. However, there is some serious talent in The Company, I just feel the energy needs to be lifted a few notches, which they have time to do during the remaining tour dates. 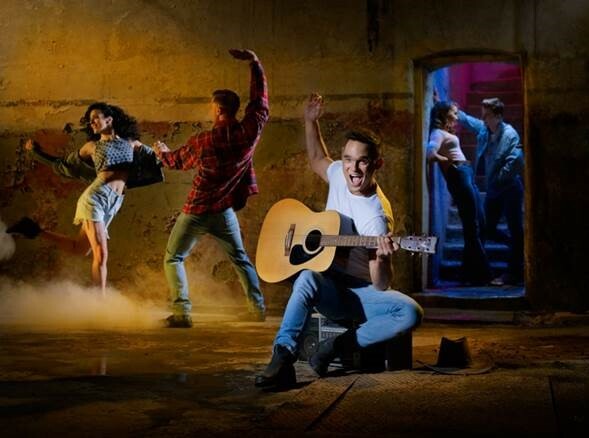 @FootlooseTour Book now at www.atgtickets.com/Manchester or by calling the box office on 0844 871 3019.